Sound too good to be true? It probably is! All of you who are reading this have probably had those emails promising “page 1 of Google”, “buy 1,000 backlinks to your site” or “amazing search engine results, quickly”. I have heard of people getting 3 to 4 of these per day. 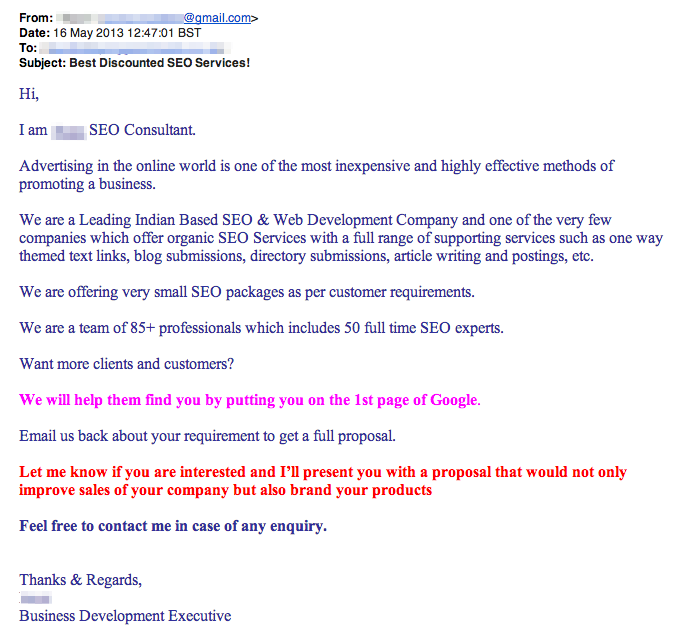 There are even businesses that promise results driven payment, but these can be even worse than those offering just cheap SEO. Like everything in life, there is no easy, quick fix to SEO and other online marketing that will work long term. Also, like everything else, if it sounds too good to be true it is and if you actually take these companies up on their offer they could be dramatically damaging to your website and your business in the long term. You won’t be expecting me to say this but these companies that promise page 1 of Google, may actually achieve this. They will most likely use methods that will actually harm your website long term but initially these methods can work. These companies can do bad things to your website in order to get quick wins that get your website to page 1 of Google. After this they will probably disappear and leave you to slide back down the rankings, or worse, face the wrath of Google, who can punish you without warning. Most people don’t know this but Google penalise websites for doing what they consider to be the wrong, “black hat”, methods. If you are seen to be using bad methods to rank on Google they can and will knock you down the listings. A very large company recently was penalised and disappeared from the Google pages altogether, even on their own brand terms. This would have resulted in a huge drop in sales and revenue. Once you have been penalised, you have to work your way back up. This has to be done with the good methods, which take time, effort and money. It will take you longer to get back to being listed anywhere near the first page. You need to be doing several things to get your website to the top spots on Google and these are all time consuming and have to be done right. Like all other marketing activity, you should think about what you need to do for your website and what you can do for your website realistically with the resources you have. If you feel you are at the stage to talk to someone about your search marketing, you need think about it the same way as you would think about any other marketing activity. They should want to know about your business and how they can help and work in partnership with you. Is honest and realistic about the timescales and investment involved. Have testimonials or examples of their work from respected companies to show you. Talk to you about relevant traffic. There is no point in having an extra 60,000 visitors per day if none of them buy from you because they didn’t mean to go there in the first place. They should work in a way that keeps the emphasis on them and how they work. You want them to keep working hard and having to explain what they are doing and what they are going to do next. Not being tied in to long contracts and regular reports are good for this. Come back to you with a presentation or plan based on the information you have given them. It’s not cheap to use an agency so you have to think about this. You need to ask yourself whether you and your business are ready yet or can cope. Are you the right size business? Will you get good ROI? Can you do enough yourself to get by? Can you afford the investment until it starts working? Can you expand if you need to? Only if you get the right answers should you give this a go. Good agencies will talk this through with you to make sure it is the right time to go ahead, so look for one of them and as with anything else that effects your business take some time to make an informed decision.